25 days of the best Australian beauty products in a beautiful keepsake box - the most coveted gift this Christmas. Enjoy beauty treats every day. Lotions, serums, soaps, polish, powder and so many other luxury products. Count down to Christmas or all at once on Christmas day. What have we here? 25 days of natural beauty with luxury products from the best Australian brands. 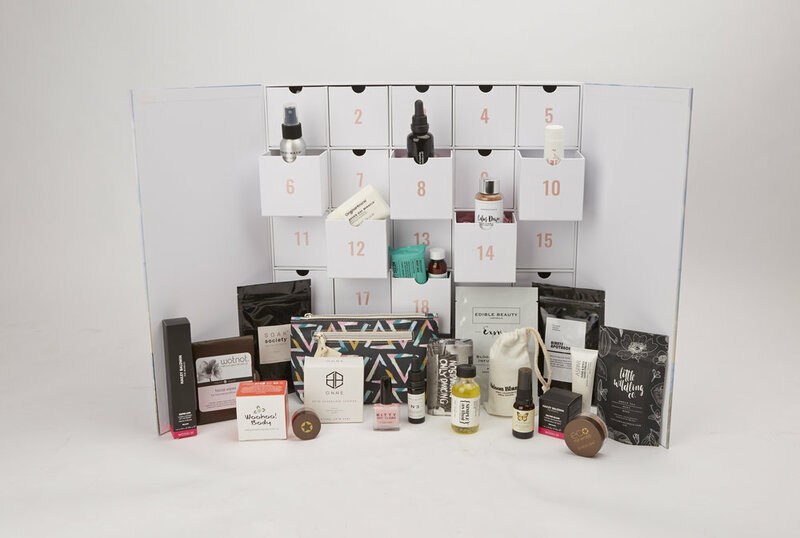 From Rohr Remedy to Edible Beauty, O&M Original Mineral, Aurora Spa, Simple as That, ModelCo, Onne Beauty and Ausceuticals to name a few, discover what we have in store in the 2017 Beauty Advent Calendar. It's a wonderful way to try all the best new products. With over RRP $460 of gorgeous products in a stunning keepsake box, The Beauty Advent Calendar is amazing value at $199. Only a limited edition of calendars is available this year. Each one showcases the best in beauty with drawers full of natural luxury products to try. All Australian brands, and 100% cruelty free. The beauty advent calendar has 25 drawers each containing a luxury beauty product, for each day of advent, or all together. On Christmas day there is a special surprise, and it smells just like Christmas at the beach.